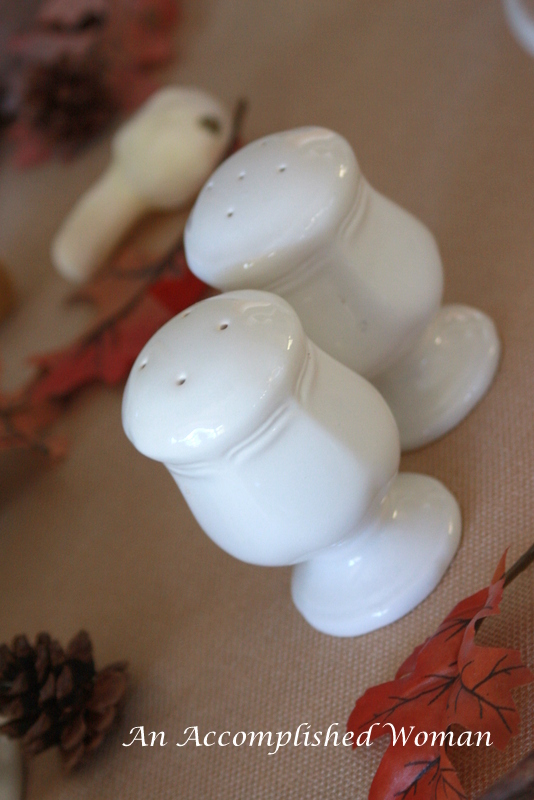 Fall is my favorite season but everything does not have to be orange, brown and yellow. I love softer things this year. I already had a white fall table for the family but with Thanksgiving around the corner, I wanted a soft fall table for Sunday dinner. 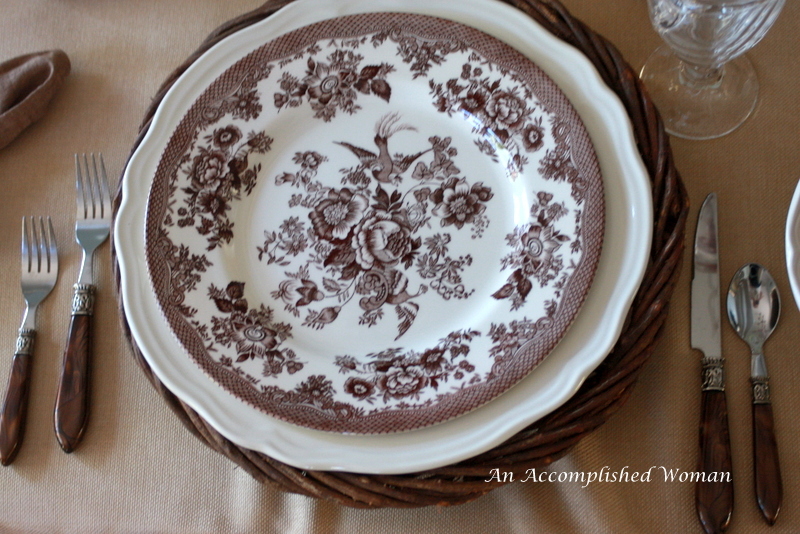 Pottery Barn chargers add a natural element to the table. Stacking brown transferware with my everyday dishes create a beautiful palate for the table. 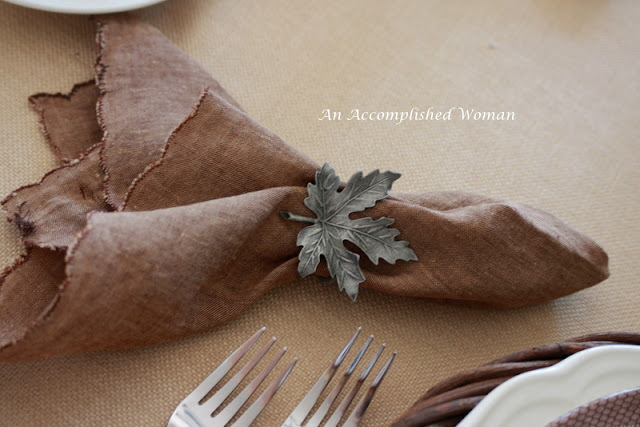 with pewter maple leave napkin rings are the icing on the cake. 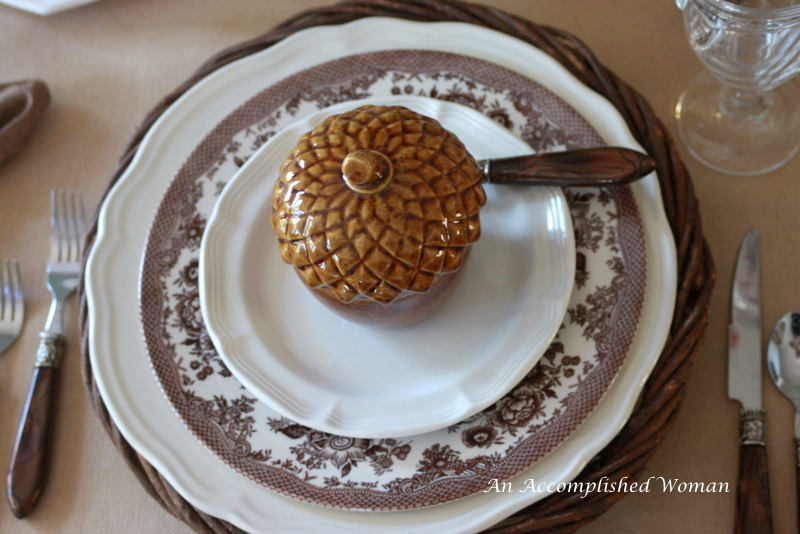 We are having soup for a starter course and I love these acorn bowls, especially when I found them at Hobby Lobby at 75% off. 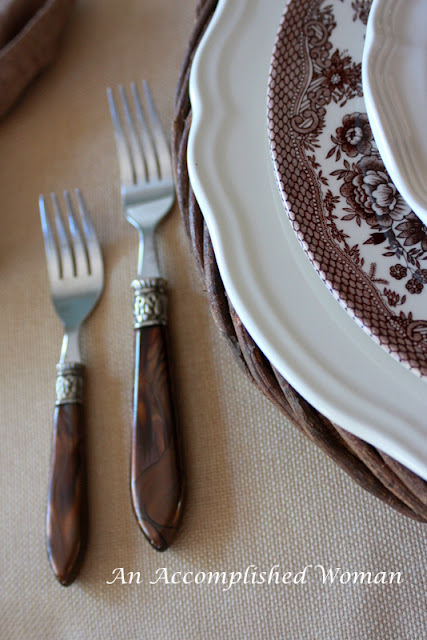 Brown flatware help pull the table together. I used silk flowers in a white urn to set the tone. 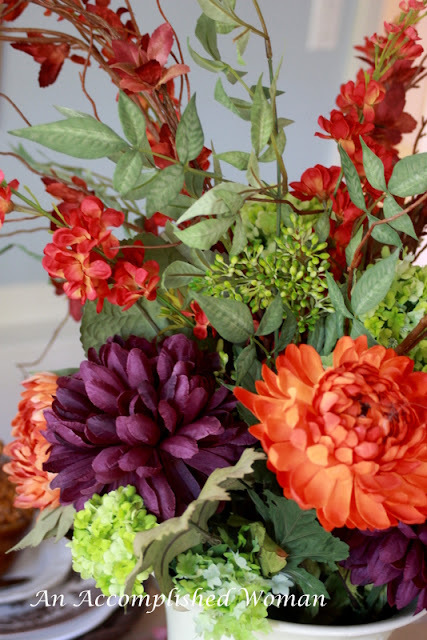 Silk flowers have gotten a bad rap lately. But there are no flowers in my garden and I love that you can put out a vase of flowers and the table looks completely different. I found multiple pieces of Italian Countryside from Mikasa at a yard sale for $5. 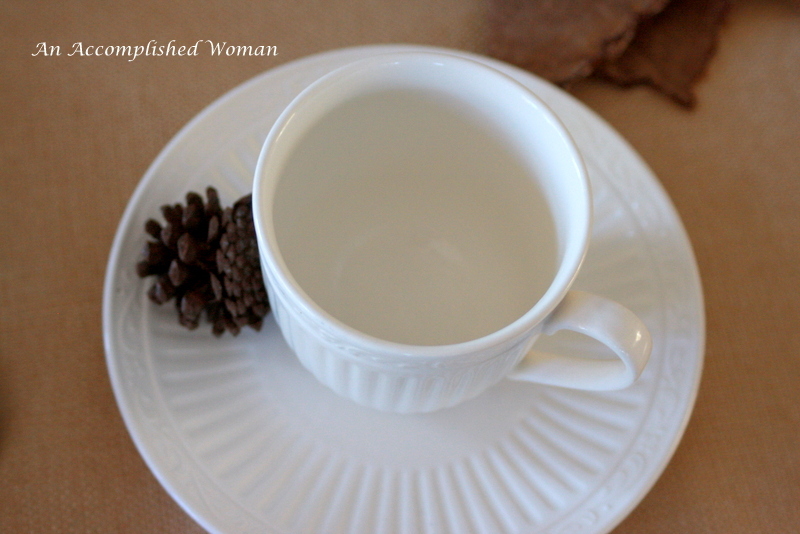 These cups are beautiful on the table. Another yard sale find. 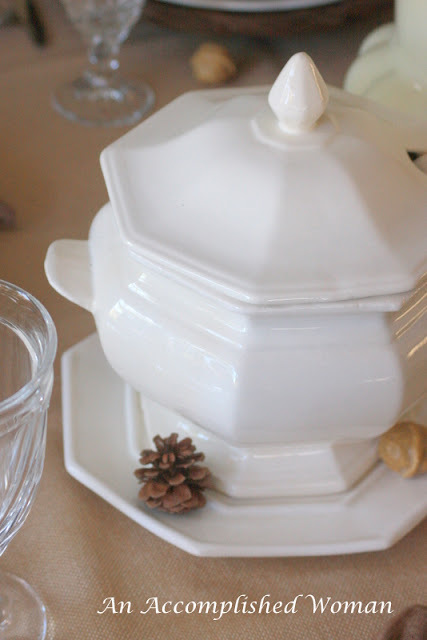 A beautiful soup tureen for $5. 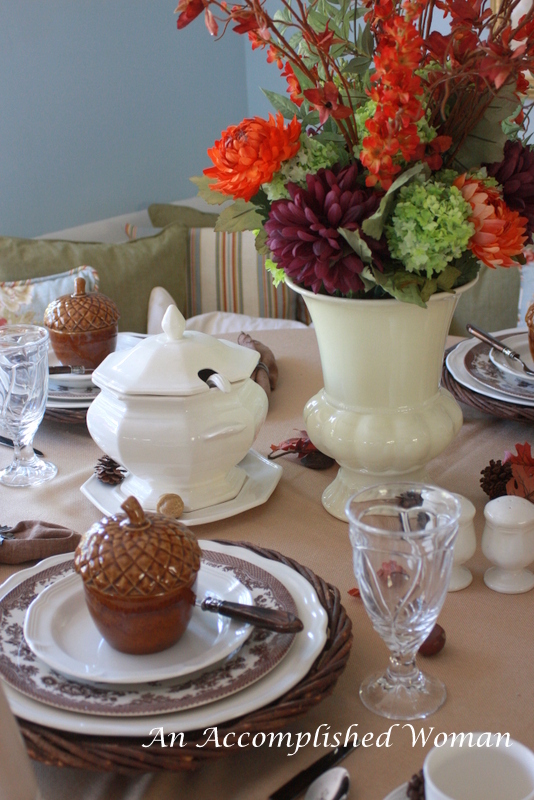 Acorns and leaves always make a table look festive. I am joining Susan at Between Naps on the Porch, Kathleen at Cuisine and The Style Sisters. Get outta here! Really? Those cool acorn bowls at Hobby Lobby??!?!? and at 75% off, you just can't go wrong!!! Wow! I love the splash of color in the center that offsets the neutrals surrounding it. Very pretty! The scalloped edge on those napkins is exquisite. I don't think I have one single napkin with a scalloped edge. They're gorgeous! Beautiful table, Cynthia! That's Sunday dinner in real style!!! 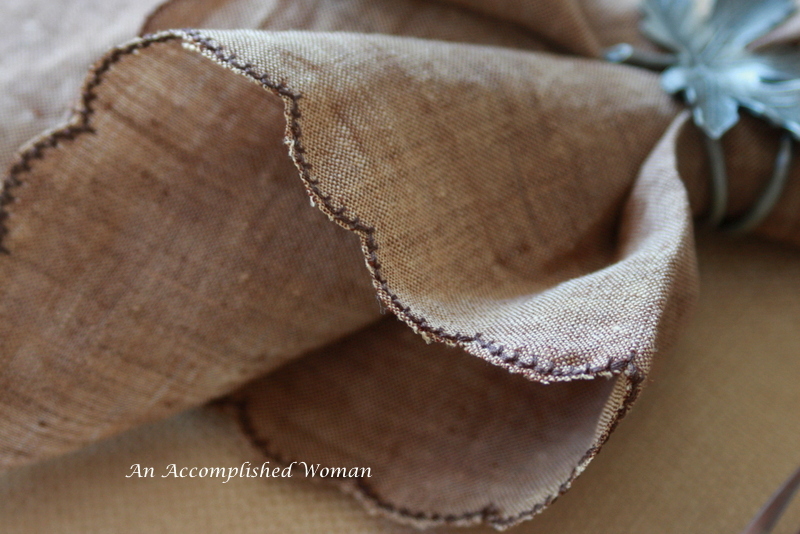 Wow, some really great finds there and I'm beyond impressed with the napkins. Now I want to get a sewing machine and go to town. Lovely colors for a lovely table. 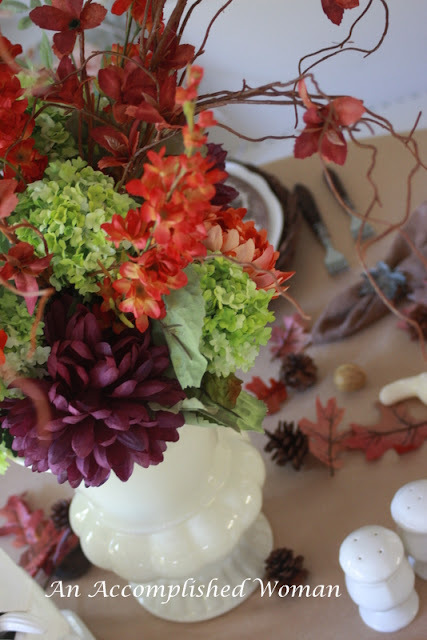 Pretty fall tablescape! 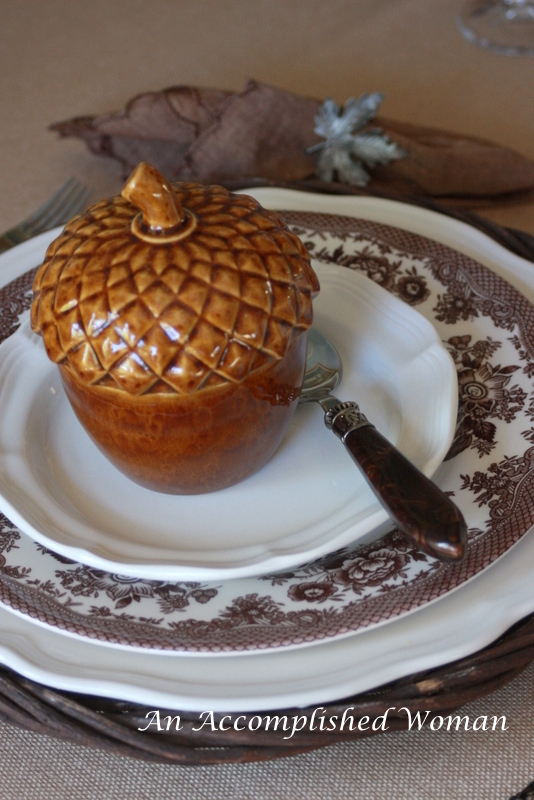 The acorn bowls are an added bonus with you layers of plates. The napkins edging is very pretty with the leaf napkin rings. Soup is great on a cool autumn evening. Beautiful table. Those acorn bowls are adorable...even better they were 75% off! Great deal on the tureen, too.